These taps & dies cannot be compared with other suppliers, as they are superior quality. They are used for cutting internal and external threads, in most steel, including stainless. If these taps & dies are cared for & used correctly then they should last a long time, as found by our customers since 1970's. 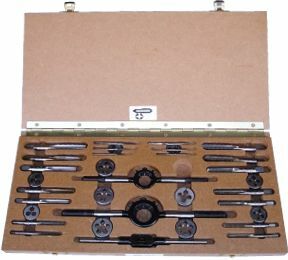 By ordering this set, you are buying superior quality taps & dies at the LOWEST prices, direct from the 'source' of supply of these tools.